Welcome to Gramp’s Old School! My dad, mom (Gramp and Em ) and I purchased the Center Falls school house in the fall of 2017. My dad’s father, Richard Tefft Sr. (my grandfather) attended the school as a boy in the 1940’s right before the one room school houses were shuttered and schools were centralized. Hence the title “Gramp’s Old School.” We later learned that my great grandmother Martha Dewey Tefft also attended the school circa 1915. For more on Grandpa Tefft check out his page here. Gramp’s Old School was built in 1850 and is located outside of the small village of Greenwich, in beautiful Washington County, New York. It is literally 100 yards from my family home and I passed it every day as a child on my way to school. The property was in horrible disrepair when we purchased it. The inside had severely deteriorated and was home to generations of raccoons and various other creature families. It came complete with a hole in the roof and a hole in the floor to match. Needless to say as soon as we went inside we fell in love! The plan is to convert the school house into a one bedroom, one bathroom “tiny house.” We are committed to retaining as much of the original character and features as possible, while at the same time making it able to function for modern day. The school house has no formal septic system (can you say chemical toilet? ), no running water, and no modern electricity. For more details on the lengthy list of renovations check out the No Really….Now What?? post. We’re still working on the how. We have limited funds but a lot of passion and dedication. We’re rolling up our sleeves and doing as much of the labor as we can. This is truly a family affair, with my siblings, extended family, and friends pitching in. See the About Us page for a run-down of who’s who. You can follow us as we adventure through Gramp’s Old School by receiving updates on new blog posts to your email. Sign up to to follow us on the left side of this page. That was back in March of 2017, which was a hectic time for my family. We were preparing for my husband, Ben to have major surgery to remove a large benign brain tumor. We were also first time parents to a then 15-month old baby, Philip. We had spent the last 9 years in North Carolina and just moved back to our family home in Upstate New York. Our dog developed major back problems and needed to be carried everywhere. So of course it was the best time to embark on a real estate investment! The end of summer loomed, Ben was doing much better and came through the surgery with flying colors and our 10-year-old miniature dachshund made a miraculous recovery. So after much back and forth, research, and a few site visits we decided we’re in love. I made an offer through our realtor, Abbey, so did someone else, they accepted our offer and we closed! Hurray?!?! photo we sent to the owner hoping that he would accept our offer, Philip had just woken up from a nap and was pretty much screaming and Gramp had just gotten out of work! I also kind of fell in the ditch that’s right in front of us…. oh my gosh, I had never seen that last photo. Made me laugh. haha yep and Ben grudgingly took the picture…he was probably hoping they’d reject our offer! 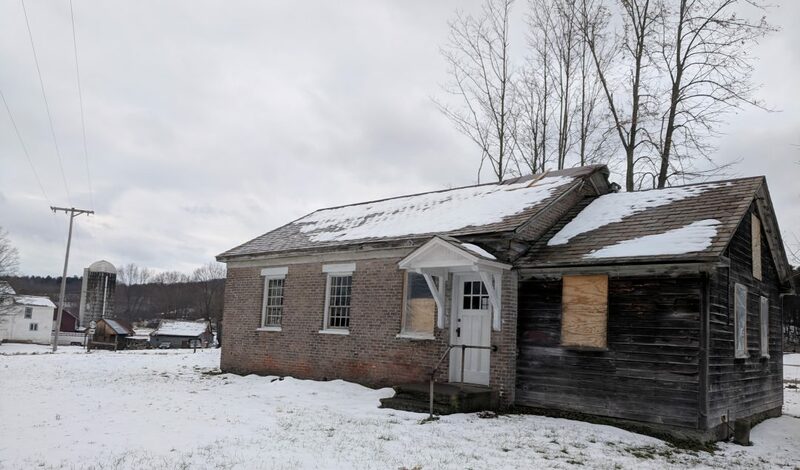 I saw the Zillow listing for this schoolhouse, and it became the little dream of my imaginary life where I live in a historical house and spend my days creating art….well, I was in no position to buy anything let alone real estate in need of renovation. I am so happy to learn of your mission. Maybe I can be an Airbnb customer for a weekend! Yes of course, come and stay when it’s done! It is perfect for creating art (the next blog post is going to be about local artists)!